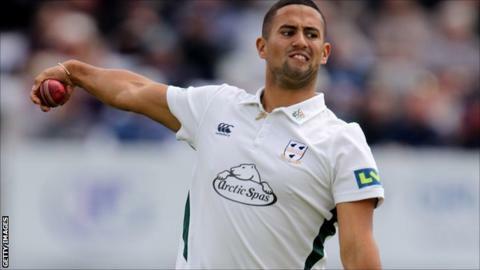 Worcestershire all-rounder Brett D'Oliveira claimed a career-best 5-48 against Durham to keep hopes alive of escaping the drop back to Division Two. Knowing that they must win the game to stand any chance of staying up, the visitors appeared to have been stymied by the weather on day two. But, resuming on 223-4, they declared eight overs before lunch on 350-7. After bowling out Durham for 277, Worcestershire then increased their lead to 115 by reaching 42-0 at stumps. After the complete loss of the second day, which followed a first day curtailed by bad light, Worcestershire made up for lost time by adding 127 in 18.4 overs in the morning session. On the day big-hitting Ross Whiteley's match-winning qualities were recognised by the England selectors, the 27-year-old Yorkshireman was the main aggressor as 30 came off the day's first five overs. Worcestershire's first innings was the first time this season at the Riverside that Chris Rushworth, the country's leading championship wicket taker with 82, has not managed to claim a single victim in an innings. The powerful left-hander made 51 off 63 balls, aided by the recalled Tom Kohler-Cadmore who almost doubled his overnight 46 before being stumped for 89 off leg spinner Scott Borthwick. At 350-7, Steve Rhodes' side still had 8.2 overs in which to try to add 50 runs needed for a fifth batting point, but instead they preferred to let loose their new signing, West Indian paceman Shannon Gabriel. He struck Michael Richardson on the helmet but could not make any breakthrough as opener Mark Stoneman (52) made a 53-ball half-century. Instead, despite 73 from Borthwick, his 10th first-class fifty of the summer, D'Oliveira and fellow youngster Ed Barnard (3-63) did the damage. When Worcestershire batted again, D'Oliveira, who had made 36 with the bat in the first innings, then continued his excellent match by reaching 32 by the close, unparted from skipper Daryl Mitchell (10 not out). While Worcestershire must also win against Middlesex next week to stand any chance of avoiding relegation for the fifth time in 12 summers, fifth-placed Durham will be mathematically safe if they hold out for a draw. "It's good that I've been more consistent but massively frustrating that I haven't gone on to make big hundreds. "I hope I've put us in a good position. We will back ourselves to chase down whatever target they set us." "It's great to get my first five-for. It's been my best day in first-class cricket, but it won't mean anything unless we push on and win. "Not having Saeed Ajmal gave me more chance to bowl, but he helped me a lot with both technical stuff and the mental side or how to read a batsman. The odd one turned and it was just a matter of staying patient and waiting for the batsmen to make mistakes."